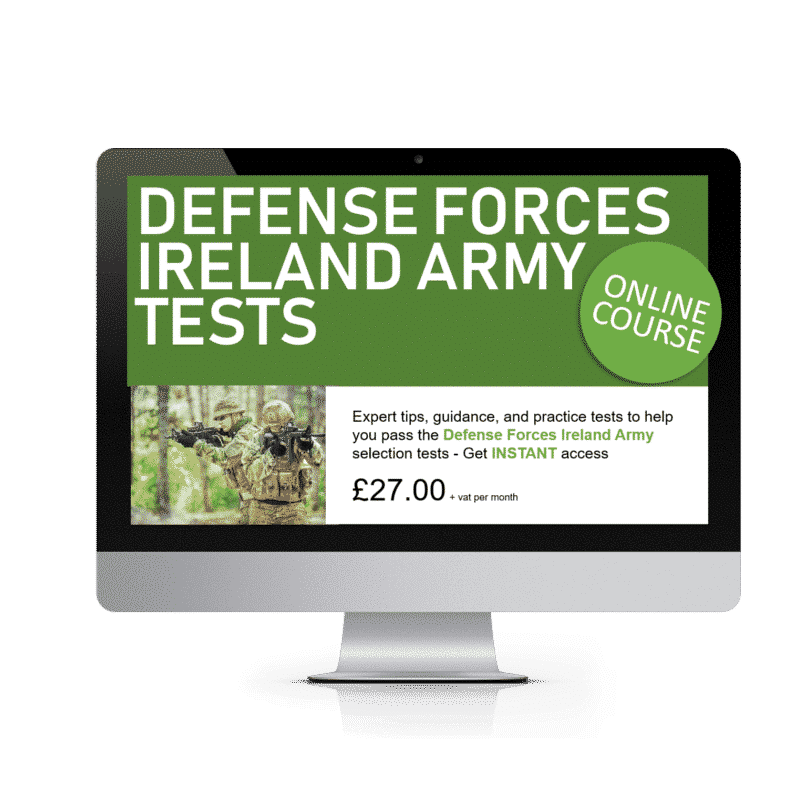 The Defence Forces Ireland Army Tests online course gives you everything you need in order to prepare effectively for an application to join Ireland’s armed forces. As an applicant, you’ll need to pass a number of different tests, all of which assess candidates’ skills in different ways. From fitness to verbal reasoning, and from numerical to diagrammatical reasoning, there’s a lot that you’ll need to prepare for in order to pass the tests and move forward with your application. What are the Defence Forces? The Defence Forces are Ireland’s armed forces. The Defence Forces, or Fórsaí Cosanta, is an umbrella term for the Irish Army, Naval Service, Irish Air Corps and Reserve Forces. Depending on the branch of the Defence Forces that you are applying for, the requirements will differ. This course focuses on an application to join the Irish Army, as well as the tests that an applicant must pass. The Irish Army has existed for just under a century, and currently consists of approximately 7,300 permanent personnel. On top of that, there are approximately 2,200 Reserve personnel. In recent years, the Irish Army has predominantly focused on peacekeeping missions globally. Both men and women are recruited by the Irish Army. Enlisted personnel in the Irish Army experience 29 weeks of training before officially becoming a fully-trained soldier. Training will be arduous, which means that applicants must ensure that they are up to the task. 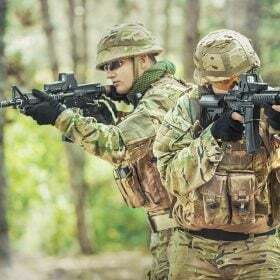 While there are no shortcuts to becoming army-ready, this course will provide guidance on making your journey to being a preferably candidate as clear as possible. This course will provide guidance on all four of these areas, including general preparation, test rules and information, and expert tips to give you as much chance of passing as possible. Additionally, you’ll be given access to sample questions for the verbal, numerical, and diagrammatic reasoning tests, giving you the opportunity to prepare and improve your chances of success. The key to a successful fitness preparation strategy is variety and continuous improvement. When you commence your fitness programme you should be highly motivated. The hard part will come a couple of weeks into your programme when your rate of improvement decreases. It is at this point that you must vary your exercise routine in order to ensure that you stay on the right track and so that you don’t lose interest. The reason why most people give up on their fitness regime is mainly due to a lack of proper preparation. Preparation is key to your success and it is essential that you plan your workouts effectively. As you are fully aware, soldiers are extremely fit people and they take a great pride in their appearance. Some of them will be keen runners whilst others will be keen weight trainers. In the build up to the fitness tests you should concentrate on specific exercises that will allow you to pass the tests with ease. These exercises may not be what you expect, simply because they are not based around lifting heavy weights or running extreme marathon distances! A 1.5 mile run in the fastest time possible. As many sit ups as possible in two minutes. As many press ups as possible in two minutes. The tests will be easy to perform as you do not require a gym or gym equipment to carry them out. Once you have done all three of these tests you should write down your results and keep them safe somewhere. After two weeks of following your new fitness regime, do all three tests again and check your results against the previous week’s results. This is a great way to monitor your performance and progress and it will also keep you motivated and focused on your goals. Before you get started with stretching and targeted exercises, write down everything you eat and drink for a whole week. You must include tea, water, milk, biscuits – anything and everything that you digest. You will soon begin to realise how much you are eating and you will notice areas in which you can make some changes. For example, if you are taking sugar with your tea then why not try reducing it or giving it up all together. If you do then you will soon notice the difference. Because you are about to embark on a rigorous fitness training regime you will need to fill your body with the right type of fuel. This includes both food and drink. Let’s get one thing straight from the offset: if you fill your body with rubbish then your fitness performance is likely to be on a par with rubbish. Fill it with the right nutrients and vitamins then you will perform far more effectively. During your fitness training programme you should totally avoid the high calorie foods that lack the right level of nutrients such as chips, burgers, chocolates, sweets, fizzy drinks, and alcohol. Instead, replace them with fruit, vegetables, pasta, rice, chicken and fish. You also need to make sure you drink plenty of water throughout the day in order to keep yourself fully hydrated. This will help to keep your concentration levels up which you will need for the fitness tests. Many people who keep fit will use vitamin supplements and energy enhancing drinks. You don’t need any of these providing you drink plenty of water and you stick to a balanced diet that includes the right vitamins and nutrients. Spend your hard earned money on something else instead rather than buying supplements, powders and energy drinks. It is important that you start to look for opportunities to improve your fitness and well-being right from the offset. These areas are ‘easy wins’. Only you will know how fit you are. First of all, write down the areas that you believe or feel you need to improve on. For example, if you feel that you need to work on your upper body strength then pick exercises that will work on that area for you. The key to making improvements is to do it gradually, and at one step at a time. Try to set yourself small goals. When you carry out your initial ‘self fitness test’ you may find that you can only achieve a few press ups, sit ups and pull ups. Instead of focusing on the magic target of 20 press ups within 1 minute, break down your goals into easy to achieve stepping stones. For example, by the end of the first week aim to an additional 5 press ups and sit ups. Then, add another 5 to the second weeks target and so on and so forth. One of the biggest problems that many people encounter when starting a fitness regime is they become bored very quickly. This then leads to a lack of motivation and desire, and soon the fitness programme stops. Change your exercise routine often in order to maintain your interest levels. Instead of running everyday, try swimming or indoor rowing. This will keep your interest and motivational levels high and it will also work other muscle groups that running cannot touch. How many people stretch before carrying out any form of exercise? Very few people is the correct answer. Not only is it irresponsible but it is also placing yourself at high risk from injury. The last thing you need is an injury, especially after the amount of hard work you will be putting in to ensure you pass. Make sure you stretch fully before carrying out any exercises. You want your Army career to be a long one and that means looking after yourself, including stretching! It is also very important to check with your GP that you are medically fit to carry out any form of physical exercise. To perform this stretch effectively you should first of all start off by facing a wall whilst standing upright. Your right foot should be close to the wall and your right knee bent. Now place your hands flat against the wall and at a height that is level with your shoulders. Stretch your left leg far out behind you without lifting your toes and heel off the floor, and lean towards the wall. Once you have performed this stretch for 25 seconds switch legs and carry out the same procedure for the left leg. As with all exercises, stop if you feel any pain or discomfort. To begin with, stand with your feet slightly apart and with your knees only slightly bent. Now hold your arms right out in front of you and with your palms facing away from you with your fingers pointing skywards. Now place your right palm on the back of your left hand and use it to push the left hand further away from you. If you are performing this exercise correctly then you will feel the muscles in your shoulder stretching. Hold for 10 seconds before switching sides. Before you carry out any form of running then it is imperative that you stretch your leg muscles. 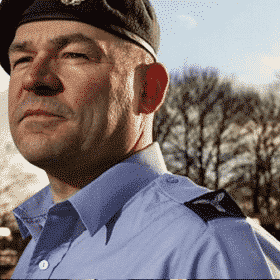 During the fitness tests the instructors should take you through a series of warm up exercises which will include stretching the quad muscles. To begin with, stand with your left hand pressed against the back of a wall or firm surface. Bend your left knee slightly and bring your right heel up to your bottom whilst grasping your foot with your right hand. Your back should be straight and your shoulders, hips, and knees should all be in line at all times during the exercise. Hold for 25 seconds before switching legs. Sample questions for the verbal, numerical, and diagrammatic reasoning tests which will allow you to prepare as much as possible for your Irish Army tests.